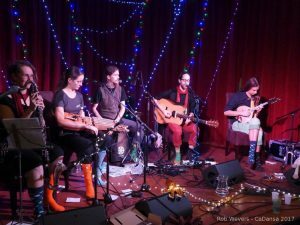 Harmony Glen in their livingroom with music and Q&A – Part 1! To win the live album, share this post and set it to public before 18:00h CET on the 6st of April. 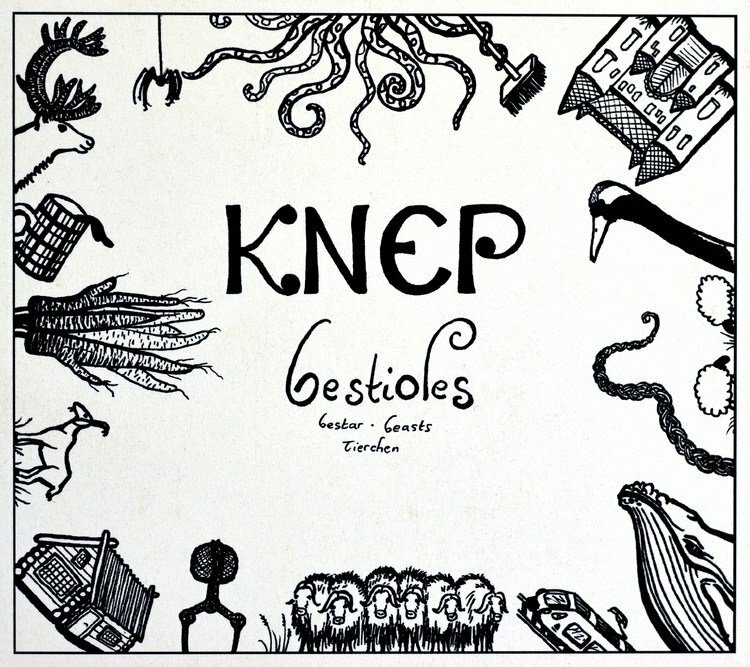 KNEP is a young Swiss duo formed by Emilie Waldken and Pascal Rüegger. 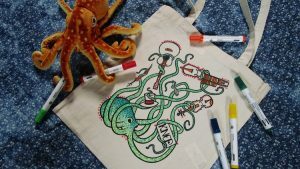 Their first CD, Bestioles, is a beautiful piece of traditional Scandinavian folk music, with a lovely pure, natural feel to it. Promoting the music they both fell in love with in a beautiful way. The CD came out early 2016. So it’s high time we finally introduce KNEP properly. Starting with a cheerful Emilie. What would be your favourite instrument? And Pascal? Are you also classicly trained? Pascal Rüegger (PR): ‘No, I started making music at age 6 with violin. I didn’t stick to it for a long time though and switched to guitar and drums. Soon I started to mess around with a lot of different instruments (singing, piano, percussion, saxophone, cello, mandolin…). How did KNEP start as a duo? EW: ‘It was a bit before I went to Sweden that Pascal and me met during a balfolk ball. First we jammed, slowly a common repertoire was created, until one day we stepped on stage. KNEP was born. So KNEP is really a classically-trained fiddler having a passion for nyckelharpa, who met a jazz guitar and bass player, and them ending up in a duo! We like to stick to the Scandinavian style, using the tradition we both studied as much as possible, and then to expand it with our backgrounds (baroque & jazz) and follow the inspiration we get from the vivid folk music scene in Sweden: modern, passionate, crazy and wonderful. (Pascal also went to Sweden to study the folk tradition, although his focus was more on dancing). By the way, what does ‘KNEP’ mean? 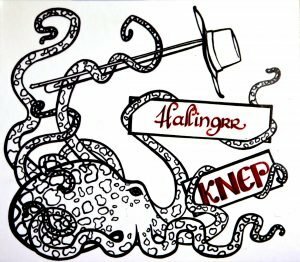 EW: ‘KNEP’ was chosen as a name because we wanted a Swedish word, that German-, French- and English-speaking people can pronounce without problem. Also something short and easy, quite catchy. I looked up different Swedish words meaning more or less silly things and ‘trick’ appeared to be quite fitting (though we didn’t know ‘knep’ has a very different meaning in Danish which makes it a very poor choice to have when we play in Danemark. But well, if we ever get gigs there, we’ll go under “duo Waldken-Rüegger”. So why Swedish folk, why not Swiss? Scandinavian music is just one of our favorite styles, and very personally, I feel totally Scandinavian at heart (I can’t decide between Sweden and Norway, so I say Scandinavian). Pascal, you were responsible for recording the songs. Something you learned at school during your jazz education I guess? I noticed you used as little effects as possible on the instruments during recording, giving Bestioles a real pure and honest sound. PR: ‘Indeed, the effects are on the discrete side. 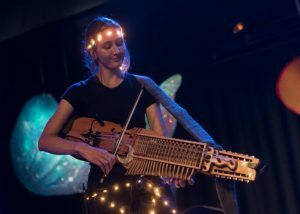 One thing that facilitates that a lot is the nyckelharpa having its own reverb due to the resonance strings. For me the process of mixing the album was a lot about finding a good balance of keeping that pure and honest sound while still using the possibilities that recording offers us, making things sound a bit “bigger” than they might be in real life. Well, the CD sounds wonderful in that way. The instruments really come alive in their purest form. What I also love are the small stories accompanying the songs in the booklet. The whole artwork is really cool actually. How does the future look for KNEP. Any special plans? EW: ‘Hmm, that’s a good question. We have been talking about a new album, because there are no Halling tunes on the first one and this is really sad. So the idea of a new album is there, though not very precise yet. We are basically working on new repertoire before we plan any serious recording session. I guess a new album will feature a bit more Scandinavian stuff and less balfolk, including probably several Norwegian tunes. We are also working quite a lot on dance teaching. We give Scandinavian dance workshops in Switzerland and abroad. It’s a way for us to create space for the music we love to be played on stage. You need dancers who know what kind of dance is played, to make it a good thing for a band to play that style on stage. Especially as we play less for concerts, much more in balfolk venues. 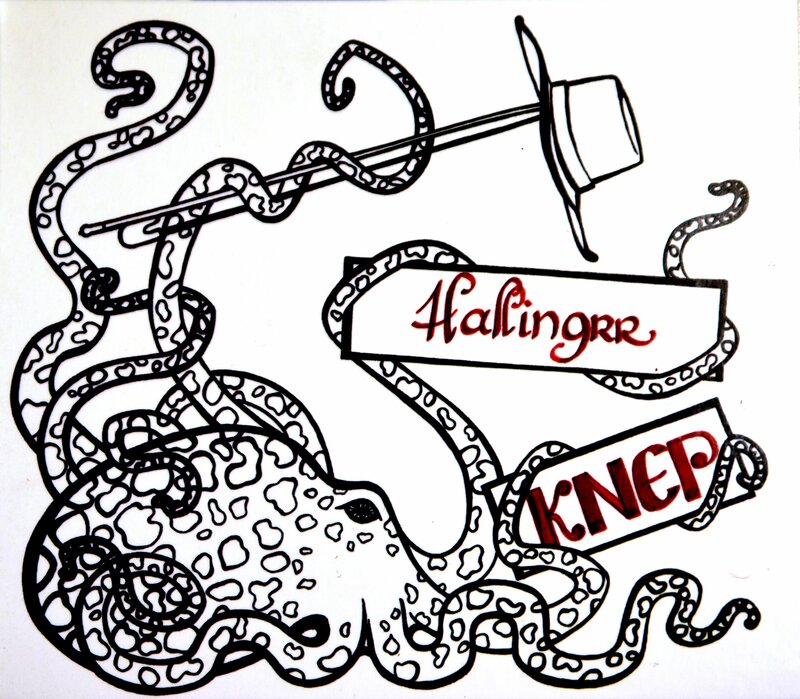 For example, for a year now we have been teaching quite a lot of Norwegian halling in Switzerland and the Netherlands. And we are extremely happy to see this dance getting slowly known and appreciated. We wish to go on with it and, if possible, to then introduce other Scandinavian dances to continental Europe. Polskas of course, with different regional variations, but we have also started a bit with one springar style from the region of Voss in Norway, and the old Swedish menuett… We try to help Scandinavian stuff stay beloved and alive on the continent, and if possible develop it and widen the possibilities it offers. Looking at both your Facebook pages, I can see that you are really busy in the music world. Two of those projects look especially interesting for the CeltCast listeners. First a band that has dutch members as well, Knupia. Another band I saw on your profile Emilie, Skoga Obscura , looked interesting as well. It seems to be a fantasy band, is that true? EW: ‘That’s true. Skoga Obscura is my own new little baby-project. 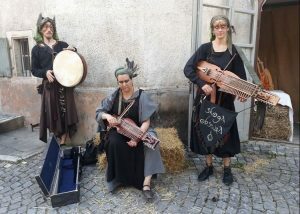 It’s my dream of bringing Scandinavian traditional repertoire into the world of medieval-fantasy events. 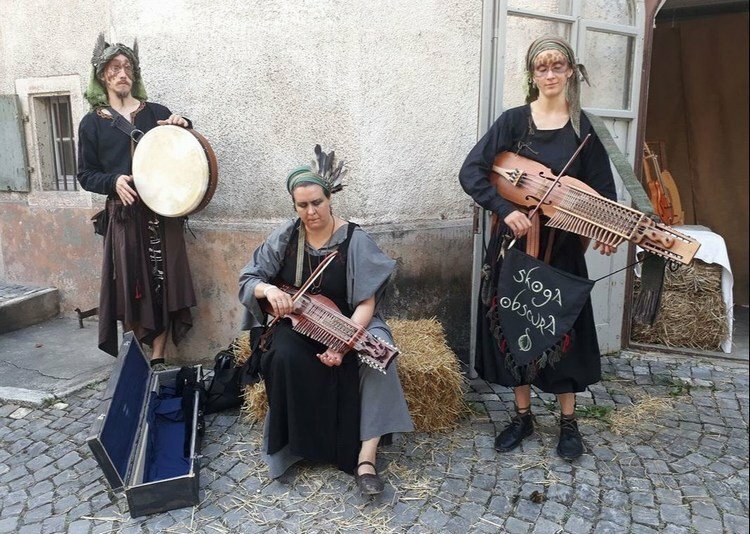 The concept is to keep the music and dances quite traditional (although we add percussion to the nyckelharpa’s, because in the streets we need something loud to carry our sound), with costumes evocating the legends of Scandinavian folklore, such as huldras, trolls, etc. We want to keep a very different atmosphere than the usual fantasy costumes, so we don’t portray anything warrior-like. Only things from the farming world. All materials are natural (no latex-ears for example) and we rarely use any metal artifact. ‘Skog’ is the Swedish word for forest, turned into a verb by adding an ‘a’. ‘Obscura’ is added to make the link to the continent and express the dark tone we stick to. So a quite proper translation of the name would be “dark foresting”. Pascal, your personal projects are more in the jazz style, so not what we could play at CeltCast. But they are interesting in their own right. How can one find info about them? With all that activity I’m starting to wonder. Is the balfolk scene that big in Switzerland? EW: ‘I would not say the balfolk scene in Switzerland is big, no. The country is tiny, and so is the scene. We have some very passionate people in there, but we all face the same problems. 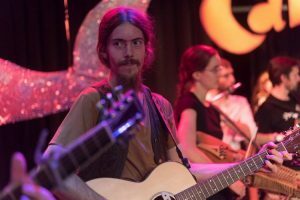 The scene is small, so we lack the possibility of organizing big stuff (which would be the way for musicians to make a bit of a living) and there is a strong language barrier. We have to expand to France (for the french-speaking area) or Germany (for the Swiss-German area) (and let’s not even talk about the poor Italian-speaking ones, always forgotten). Thus it’s not really a surprise that KNEP’s members are always on the road somewhere in Europe! Emilie, Pascal thank you for your time! Any thoughts you still want to add? As are we. 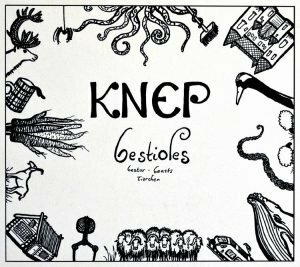 When Knep is in the neighbourhood, go check their music out. It’s well worth it! Emilie and Pascal gave this interview at the end of 2017. At that time the were thinking of a possible new CD. Just when I was about to publish this interview, Emilie emailed me to tell KNEP díd record some new songs. Better yet! That the CD would be released at Dansstage on the 13th of march. I am now allowed to tell you it has become a mini CD called Hallingrr. And that it contains four really nice Halling songs. Featuring, amongst others, the beautiful sounds of the Guitar, the nyckelharpa, the fiddle and ….a Goat??? Photo’s 1 & 2, Knep at CaDanza 2017 courtesy of Ronald Rietman . Photo 5, Knupia at CaDanza 2017 courtesy of Rob Wevers . Interview with Kati Ran and Raoul Boesten on the choir Yoik. 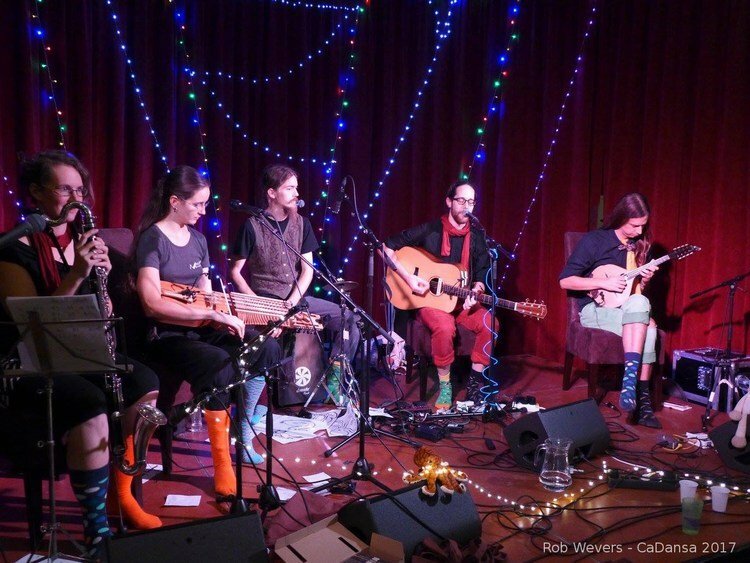 Sunfire live in the CeltCast livingroom!